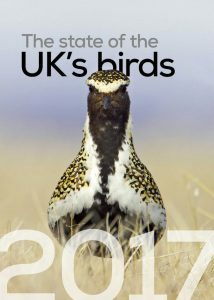 The State of the UK’s Birds is an annual overview of the fortunes of wild birds in the United Kingdom and its Overseas Territories. It draws together the most recent data from a range of sources and summarises the most important results from these annual, periodic and one-off surveys. The report uses these data to generate trends and produce indicators based upon them for the UK’s breeding birds and wintering waterbirds. State of the UK’s Birds is produced by a partnership formed of RSPB, British Trust for Ornithology, WWT, Natural Resources Wales, Natural England, Department of Agriculture, Environment and Rural Affairs Northern Ireland, Scottish Natural Heritage and Joint Nature Conservation Committee.